How many times has it happened to you, that you enter a local fish store (LFS) and find a fish for sale, labelled as a relatively rare species. You buy it and take it home, only to find out that it was in fact a very common fish, misidentified as something more unique. Recently I had the great fortune of having the opposite experience: I entered a LFS and found a tank full of "common bristlenose plecos" for sale. But upon closer scrutiny, the fish were all Ancistrus sp. Rio Ucayali. After the proper ID was made, the LFS owner kindly offered to sell the fish at the same price, which was wonderful for me! I picked up seven juvenile specimens. This bristlenose is an attractive fish: Its dark body color varies from all black in younger individuals to a duller, chocolate-brown/black in older adults, and is highlighted with numerous small silver-white spots which are almost fleck- or crystal-like in their appearance. By this I mean the spots are irregular on their edges, rather than being smoothly round or circular. The spots are separated a significant distance from one another, so there is a lot of the body's base color intervening between the spots. This helps distinguish Ancistrus sp. Rio Ucayali from common bristlenoses which have larger, rounded spots arranged closer together covering the body. Ancistrus sp. Rio Ucayali wears a splash of color on its fins, which are adorned with distinct rows of orange-to-rusty red spots. These orange-red fin spots are larger than and stand out against the silver-white flecks on the body, and it is these fin spots that give this pleco one of its trade names, the "orange spot bristlenose pleco." Unlike some Ancistrus, both male and female A. sp. Rio Ucayali possess bristles, so sexing young adults can be problematic. In adulthood, females have the typical wide midbody seen in other plecos when full of eggs; also, the females' bristles are smaller than the males', and restricted to the lips. 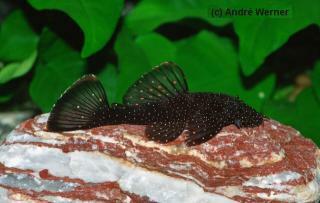 Ancistrus sp. Rio Ucayali can be confused with a number of other Ancistrus species, but can be told apart by distinct color differences and spotting patterns. Perhaps the closest match is Ancistrus hoplogenys. A. hoplogenys matches A. sp. Rio Ucayali in almost every regard except the spotting on the unpaired fins: in A. hoplogenys, the dorsal and caudal fin spots are much larger, rounded, less numerous, and not so clearly arranged in distinct rows, whereas in A. sp. Rio Ucayali, the spots are smaller, irregular-shaped, more numerous and aligned in distinct rows. Several other Ancistrus also resemble A. sp. Rio Ucayali: Ancistrus dolichopterus, A. leucostictus, A. punctatus, A. sp. L071, and A. sp. L180 to name a few. A. dolichopterus can easily be distinguished (at least in smaller adults) by the white seams on its dorsal and caudal fins, and by the lack of the distinctive orange-red fin coloration; the other species listed have body spots similar to those of A. sp. 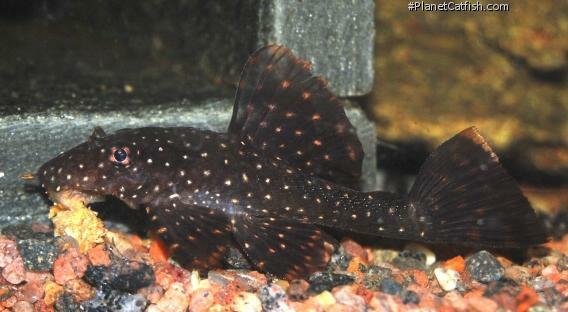 Rio Ucayali, but lack the orange-red spots on the fins and may show no fin striping patterns whatsoever. L071 can be further distinguished from A. sp. Rio Ucayali because the spots on L071 are round instead of irregular shaped. I've only had my fish a short time, but already I'm really enjoying them. Although they are shy, they seem to enjoy lining up rows, several fish resting close to one another, along pieces of wood. Such displays are a true sight for the eyes. As for feeding, they adapt well to the aquarium and accept a variety of foods. Although bristlenoses do not have a reputation as primarily wood eaters (like Panaque and Panaqolus), mine show a strong interest in eating wood, as much or more than any other food I've offered them. So give yours a good piece of wood, and keep your gravel vacuum handy. This bristlenose has not yet been given either scientific recognition with a proper description, or even an L-number for that matter. But if you can accept the fact that this fish exists in such a state of nomenclature limbo, then Ancistrus sp. Rio Ucayali is a wonderful alternative to the common bristlenose. Distribution Originates from Rio Ucayali. Other Parameters Soft to moderately hard water (100-400 µS/cm). Feeding Traditional Ancistrus such as courgette (zucchini), potatoes, green beans and brocolli, etc. As usual for this genus, moderate levels of protein rich food should be used. Furniture Suitable hiding places throughout the tank makes the fish feel more settled. Compatibility Works fine in the community tank, and as long as the other fish aren't huge, they will go with most fish. Suggested Tankmates Anything that isn't big enough to immediately swallow the Ancistrus should be fine. Breeding Cave breeder. Male guards the eggs. A mature female can produce up to 150 eggs. 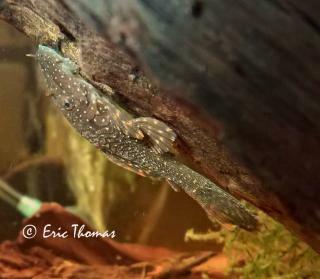 Fry are relatively easy to care for, and eats the same as adults.